Jeff Grainger is s a creative problem solver and artist at heart, with the mind of a strategist who relishes the challenge of figuring out new solutions. 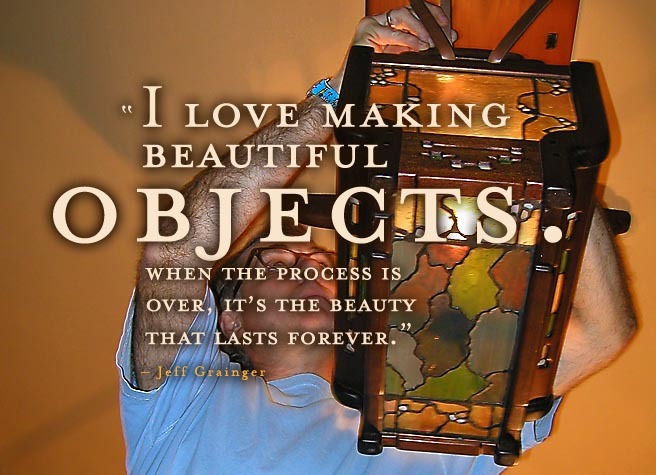 For over 25 years, Jeff Grainger has designed and realized custom, reproduction Arts, and Crafts-style furniture for hundreds of clients across the U.S., from Maine; New York; Raleigh, North Carolina; and Dallas, Texas; to Durango, Colorado; Sun Valley, Idaho; and Los Angeles, California. The curiosity and fascination that drives Jeff to build high-quality, custom furniture in the Greene and Greene style, comes naturally. He possesses a mix of deep resolve, admiration for artists outside his discipline and broad interests in life that culminate in artistic, well-built furniture with the same beauty and strength as furniture constructed over a century ago. Jeff’s clients return for the results they have come to expect: Custom design, a mix of high-quality materials and timeless creativity and craftsmanship. Jeff’s childhood interest in a toy came from taking it apart to see how it worked, then putting it back together. He built a guitar as a teen to experience working with wood and other materials to build something by hand. Problem-solving is innate to him. Traditional methods are a starting point for Jeff. He seeks new ways to combine his skills and artistic eye to build each piece of furniture, lighting, and metalwork to meet his clients’ specific needs. He carves his own path to create the ultimate beauty his clients seek. After graduating from California State University, Fullerton with a Bachelors Degree in Design, Jeff’s early career taught him about beauty, mixing materials and construction. In his late-20s, he visited the Gamble House in Pasadena, California and fell in love with the combination of art and functional objects of beauty designed and built by brothers Charles and Henry Greene. Since then, Jeff has designed and built hundreds of Arts and Crafts furniture pieces, as well as glass– and metalworks, primarily in the Greene and Greene style. His use of multiple materials results in a piece rich in details you won’t find with woodworkers who work solely with one material. Get your Greene and Greene-style lighting or furniture project started.